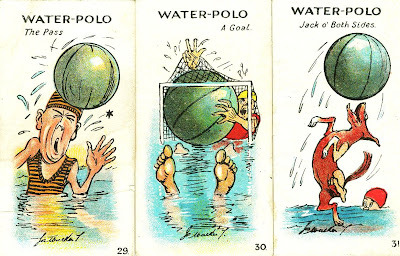 Three Water-Polo humoristic tobacco Cards issued by Major Drapkin in 1928: The Pass, Jack O' Both Sides & A Goal. These cards belong to series called Sporting Snap of 40 cards of different caricatures. Major Drapkin & Co is branch of United Kingdom Tobacco Co.